During this trip, Sunny Mind Travel team will guide you personally in a group of maximal 6 persons. They will offer you a lot of different exercises to learn how to receive energy and not letting go of all your energy. Also, you'll work on issues inside yourself that cost a lot of energy. They use mindfulness, Qi gong in the beautiful nature and at sea, yoga, and meditation. It's very relaxing and you don't need to have experience. Working on your energy level and getting to know yourself better! The accommodation is in the apartment or lodge. Do you want to determine how you live, instead of being lived? Do you give away a lot of energy from yourself and do you sometimes feel completely empty? Are you brave enough to look at yourself honestly? Do you want to learn to gain more insight into yourself, so that you can take charge of life again? Then this in-depth journey is really something for you! Who is the in-depth journey for? The in-depth journey Sunny mind up is for those who want more than just relaxing. If you would like to find out more about yourself, work on yourself and find out who you really are and what you really want now. This is a wonderful process that works well in small groups. At least that is Monique's experience. In this way, you can listen to each other's experiences and you first feel the support of the group to be yourself. This leads to very beautiful insights and growth. Then you can choose to stay an extra few days, where you will have a private training with Monique twice. Here, you will zoom in on what you encountered during the first days. But you can also indicate yourself if there are other things that you would like to highlight. Every year the journeys are different because Sunny Mind Travel deals with a different theme and chooses different exercises for the training sessions, although some exercises remain on a fixed basis. This is the basis of my Sunny mind up method. Every trip they offer is also different because the composition of the group is always different. People who come together with us in an unknown group often have a goal in common. The composition is always different, but the group shares a common goal at that time. This year, the emphasis will be on how you use your energy. Do you give away a lot of energy and do you then have nothing left? This is not necessary. Monique teaches you how to keep more energy with you. And that you can also get energy from others. She will teach you how to do this and how to avoid unnecessary deflation. She is mainly inspired by Prana Vidya for this. This is the science and manipulation of Energy from a yoga perspective. Yoga always works from the outside in. That is how you naturally know the yoga postures that work on our physical body. Then you go a little further in by involving the breathing. And one step further through meditation to get closer to our core. If we can feel again what our core, our self, wants, energy flows freely through our heart. 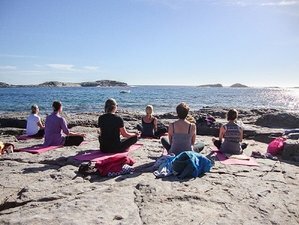 Sunny Mind Travel offers special mindfulness and yoga and lodges, holiday rentals, in Sardinia.